Pesto: Place pine nuts, garlic, and salt in a food processor; cover and pulse until finely chopped. Add watercress; cover and process until a paste forms. While processing, slowly drizzle in olive oil. Add Cheddar; cover and process until smooth. 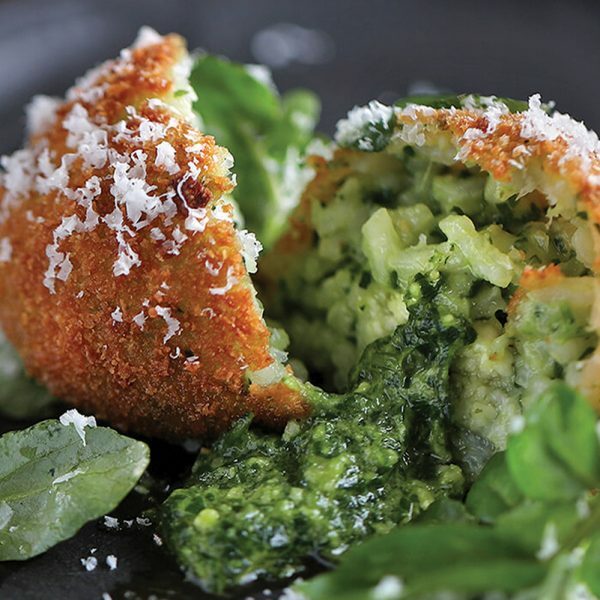 Arancini: Gently combine cold risotto with 1 cup reserved pesto in a large bowl. Divide risotto mixture into 20 portions. Shape each portion around 1 tablespoon cheddar; roll each into a ball, sealing in the cheese. In three separate shallow bowls place flour, eggs, and bread crumbs. Dredge each ball in flour; gently shaking to remove excess flour. Dip in eggs and roll in bread crumbs to coat. In a deep-fat fryer or heavy Dutch oven, heat 3-inches canola oil over medium heat to 375 degrees. Fry balls in oil, in batches for 1–2 minutes or until golden brown. Drain on paper towels. Garnish with remaining pesto, watercress, and Cheddar. Serve immediately.